ECHO hockey club was formed and affiliated with Hockey Victoria in 2002 on the back of a successful summer season trial. ECHO was founded as a sporting club that upholds Christian values, socially focused, and good sportsmanship with the purpose of providing anyone wanting to play hockey with the chance to keep Sunday free. As a one team club, the first season was a success, winning both the Minor Premiership and Premiership flag. The following year, despite losing the Grand Final the club again achieved promotion. In 2004 ECHO expanded, adding a Men’s team and a new Women’s team. The Women’s team went on to win the Club’s second Premiership, and both Men’s teams played finals. In 2005 the Men’s Firsts team moved into the State League competition, narrowly missing the finals. 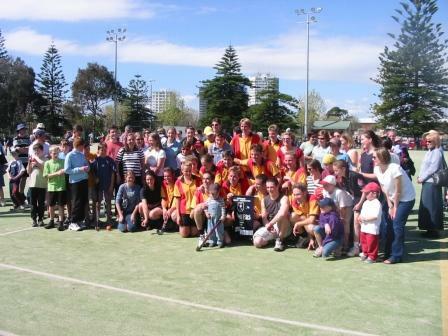 Both the Metro 3 Men’s and Metro 3 Women’s teams made the Grand Final. In 2006 the Men’s State League team won the Minor Premiership and promotion, however, lost the Grand Final. The Women’s team had a one offseason in the State League competition. In 2007 a third Men’s team, however it was a difficult season with the Men’s Metro 2 team only narrowly avoiding relegation. 2008 was the least successful season in the clubs history with no teams making the finals and relegation of the Metro 2 Men’s team. The club returned a stronger 2009 season with the Women making the finals and both the Metro and State League Men’s teams having competitive seasons. In 2010 the club built on the 2009 successes, and like 2007, ECHO again entered four teams. However, unlike the tough 2007 season, the club successfully won Metro 3, Metro 4 made the finals, and the Women only narrowly missed the finals. 2011 marked a milestone in the Club’s history with the addition of an Under 9’s junior team. Despite a generally tough year, the shining light was a dominant performance by the Women, who were unlucky to miss both the Grand Final and promotion. Winter 2012 was a breakthrough season for the Club, which has proved a turning point in the Clubs development. Additional Women’s teams and expansion of our Juniors to include Under 11’s. All senior teams finished finals contention. Metro 4 men finished third, and both Metro 2 Women and State League 5 Men won Premierships. The club continues to expand over 2012-13 Summer, this time into Masters hockey (35+). The 2013 Winter season brought both a new Club and HV competition structure. The additional Under 10’s team and continued growth in player numbers provided greater depth across the board. Metro 3 Men were runners-up, and Women Metro 3 team finished the season second. Men’s VicLeague 4 and Reserves finished top 4 and Metro 1 Women had strong seasons finishing 5th, despite significant disruptions. The Club added a fourth Men’s team in 2014. However, the season highlight was the U12’s undefeated season – resulting in the Club’s first Junior Premiership. The overall senior story was similar to 2013 with VicLeague 4, Metro 3 Men and Metro 3 Women all making the finals and Metro 1 Women and VicLeague Reserves finished just outside the top four. 2015 successfully saw ECHO achieve finals for three of our six senior teams and both the recently promoted Under 12’s and new Under 14’s teams. In 2016 the Women’s Unit, in particular, went from strength to strength. Following ECHO’s first ever Summer Season Premiership, with ECHO Women taking out first and second and then going on to play each other in the Grand Final. We added a 3rd Women’s teams – an Under 18 Development side. We also shifted our 4th Men’s team into the 35+ Master’s competition. A young Under 14’s team stepped up into the Pennant competition. Six of our nine teams went on to play finals, the highlight being our Women’s Firsts team, who went on to win the Club’s sixth Premiership, beating Yarra Valley 4-1. 2017 was an exciting year where our Junior Unit delivered its second Premiership, winning the U12 District competition. Our U14 and VicLeague 3 Men’s teams also made it through to the Grand Finals. Further to this, our Women’s Unit successfully moved to the VicLeague competition stream. In 2018, for the first time, we had Men’s and Women’s teams in VicLeague 2. Our Women’s Thirds and Under 14 Pennant teams highlighted the season with both making the Grand Final. 2019 has kicked off strongly with a resurgence of new players, development of juniors as they shift to seniors and great momentum leading into the season. We also have Men’s and Women’s VicLeague, Pennant and Metro sides as well as, Men’s 35+ Masters, and Under 10s, 12’s and 14s teams. It will be an exciting year! If you want to be part of a Club that is more than just playing sport but is still pushing to improve, grow and succeed – both on an off the pitch – then join us and register your interest at New Players.